The Keto Christmas Crack recipe is here!!! 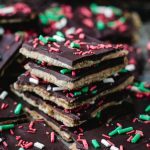 The perfect low carb keto toffee bark candy recipe for any party or to give as a gift. What’s In Traditional Christmas Crack? 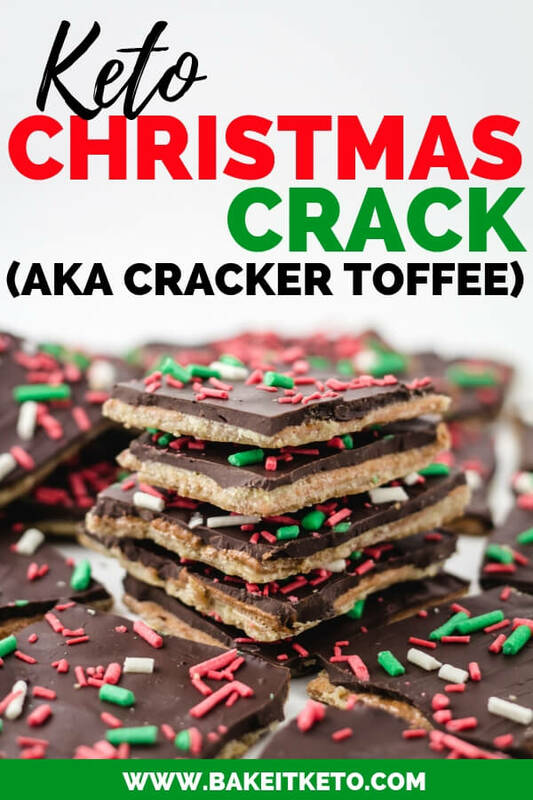 The carb-full version of Christmas Crack (also called Cracker Toffee or Saltine Toffee) is typically made with Saltine crackers. 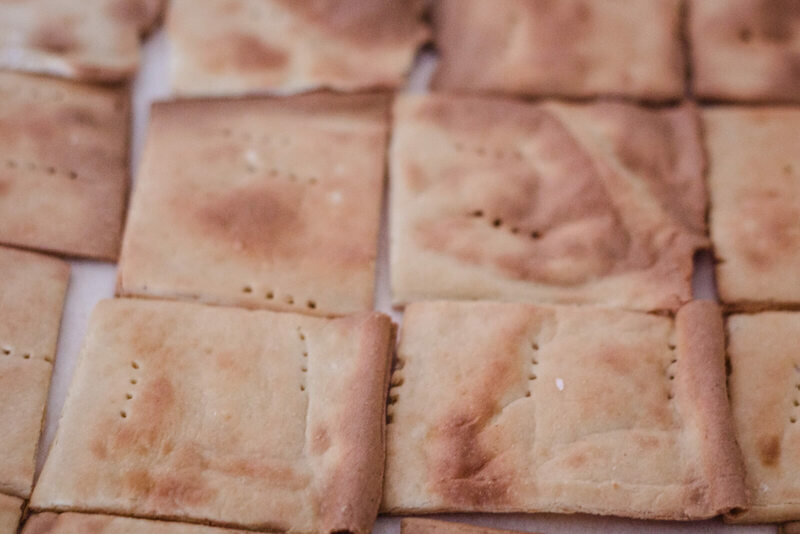 Most recipes call for one sleeve of Saltine crackers, to be exact. It’s been years since I’ve eaten Saltines and I was immediately reminded of the vintage metal Satines tin my grandparents kept in their pantry! For this keto version of cracker toffee, we’re replacing the Saltines with my Easier Coconut Flour Fathead Dough recipe. My body doesn’t do well with almonds, and I wanted to use something other than almond flour so tree nut-free readers could enjoy this recipe. The next ingredient we need to replace is the brown sugar. I am SO excited that Swerve has recently started selling their Brown Swerve Sweetener. It’s a fantastic replacement, with all of that great molasses-y, caramelized flavor that you expect from brown sugar. Finally, to replace the chocolate, this recipe uses Lily’s Dark Chocolate Premium Baking Chips. Lily’s chocolate chips are available at many local grocery stores but they are on the expensive side, so I buy the 4-Pack on Amazon to save a little. 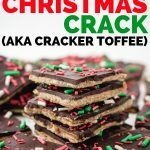 Christmas Crack is possibly one of the easiest Christmas candy recipes to make. You’ll start by making a batch of crackers with my Easier Coconut Flour Fathead Dough. Once they’re cooked, lay them in a single layer. I like to line the pan with foil first (to contain the mess) and then parchment (so the candy doesn’t stick). Next, bring the butter and Brown Swerve Sweetener to a rolling boil in a medium saucepan. Be sure to stay nearby so it doesn’t overflow and make a mess! You could use a candy thermometer if you have one collecting dust, but I would go so far as to say it’s completely unnecessary. If you do want to use a candy thermometer, cook the butter and brown sugar mixture to 270-290 degrees F.
Pour the faux caramel over the Fathead dough crackers as evenly as possible. You can even spoon a bit from the sides over the spots you miss. Pop the pan in a preheated 400 degree F oven and bake for 5 minutes. This should bring the toffee to the hard crack stage, while the crackers really start to soak it in. Remove the pan from the oven and allow it to cool for a few minutes – enough so the toffee is still warm but no longer molten hot! 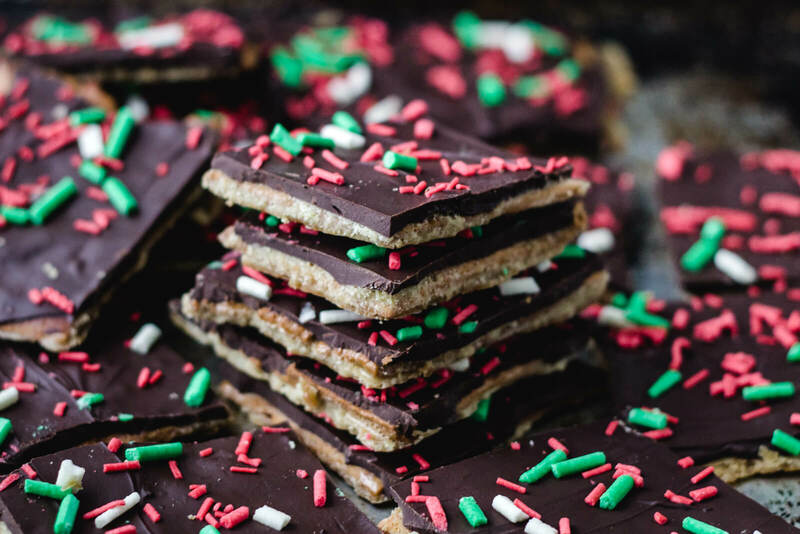 Sprinkle the Lily’s Chocolate Chips over the keto cracker toffee and let them sit until they become soft and melty from the toffee’s residual heat. 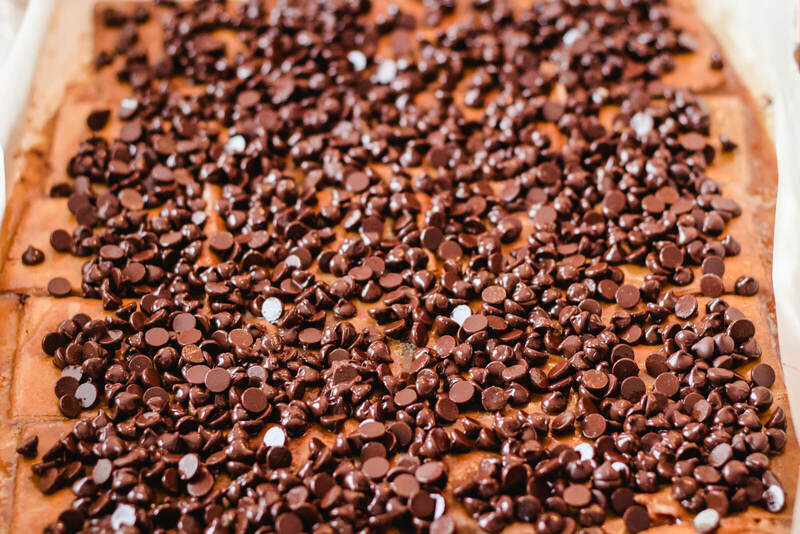 Spread the chocolate chips out to create an even top layer of chocolate. An offset spatula is the best tool for this step. The last step is optional but it really adds to the Christmas magic! Use my recipe for Keto Sugar Free Sprinkles in Christmas colors and sprinkle them over the over the top while the chocolate is still soft! Scrape the Fathead dough out onto a sheet of parchment paper and form it into a disc. Cover with a sheet of plastic wrap (to avoid sticking) and roll the dough out into a very thin rectangle that's roughly 12"x16". Transfer the dough on the parchment paper to a cookie sheet with edges. Dock the dough with a fork to avoid large bubbles and par bake at 400 degrees F for 8-10 minutes. Remove the pan from the oven and transfer it (still on the parchment paper) to a large cutting board. Using a large chefs knife, cut the soft fathead dough in 24 squares. Line the cookie sheet with foil (trust me, this will help contain the mess when you make cracker toffee later). Transfer the parchment back onto the now foil-lined cookie sheet. Rotate and/or flip the crackers as necessary for even baking, and return to the oven for 5 minutes or until lightly browned. Set the pan aside to cool while you prepare the Swerve toffee. In a medium saucepan, combine the butter and Brown Swerve Sweetener and cook over low heat until the butter has melted. Increase the heat to medium and bring to a rolling boil, watching carefully so the pot doesn't boil over. Boil the mixture for 3 full minutes. This is NOT a true caramel but if using a candy thermometer, cook to 270 to 290 degrees F.
Make sure your crackers are still lined up on the pan edge to edge. Pour the brown sugar butter toffee mixture evenly over the crackers. Transfer the pan to the oven and bake for 5 minutes. Remove the pan from the oven and allow to cool for 3-5 minutes. While the candy is still warm, sprinkle the chocolate chips across the top. Allow the chips to soften and then use an offset spatula to evenly spread the melted chocolate over the toffee. Optionally, sprinkle with homemade keto sugar free sprinkles (make them in Christmas colors using the recipe on my blog). Allow the Christmas Crack / Cracker Toffee to cool until the toffee and chocolate have hardened. If you're in a rush, pop the pan into the freezer for a few minutes to cool it down faster. 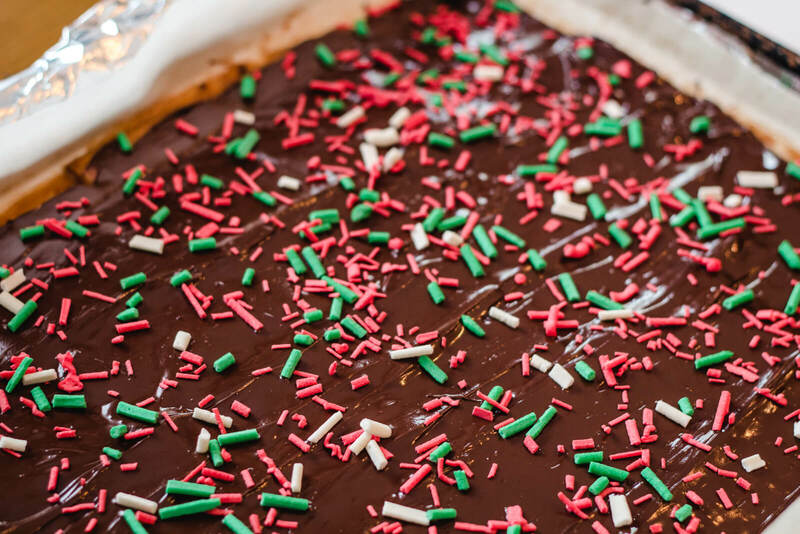 Break the toffee bark into 24 pieces, roughly along the lines of the crackers. Store your keto candy in an airtight container.